Yes! It’s Online Shopping Time! I am sure you know I love to shop online and I usually do it at night. Now days we can buy almost everything online just a few clicks away. Here are some good news! Malaysian fashionistas will get to update their wardrobe with the latest styles from Japan as its biggest online shopping mall during Rakuten Biggest Super Sale from 1st till 10th April 2014. Scream… remember to mark your calendar, login and start shopping. OMG! it’s super sale season. Rakuten is Japan’s number one online shopping site introduces a huge variety of products from fashion to electronics to beauty to Malaysia. 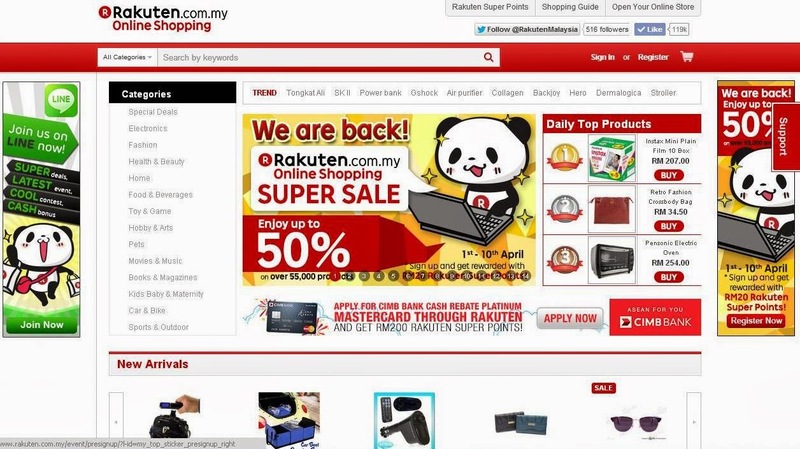 Rakuten Super Sale is held for the second consecutive year in Malaysia. There will be extensive selection of fashion and accessories from participating merchants at highly-discounted prices. Besides fashion, Rakuten is also offering massive discounts for other categories such as electronics as well as health and beauty products. Don’t miss it. Ok, I give you some ideas and tips before the sales starts so that you can prepare and look up for the items that are on super duper discounted price. Keeping in line with the Spring / Summer 2014 fashion trends from Japan, the sale offers sweet floral patterns entwined in elegant lace with a colour palette of soft pastel and vibrant shades, amongst a variety of other fashion choices. These are the brands / merchants that you might want to check out as they have a good selection of products; such as Tokichoi, Bagstation, Alfrado, Poh Kong, Luvclo, PGmall and Crocs. It’s tagline ‘Shopping is Entertainment’, Rakuten will be surprising shoppers with ‘Time Sales’ on top of the ongoing Super Sale – offering certain items at special discounts at specific times only. You can check out the Time Sale schedule through the Rakuten website, Facebook page and LINE. So have you Shoppers will have many discount opportunities as there will be 1,000 Time Sale deals this year in comparison to last year’s 100. I like these! more deals please!